The Durant Area was once claimed by both Spain and France before officially becoming part of the United States. During the 1820s and 30s the area was designated as part of the Choctaw Nation. 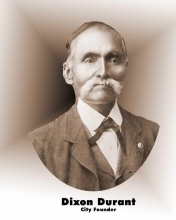 A gentleman by the name of Pierre Durant and his four sons, all of French-Choctaw origin, made the journey up the Trail of Tears on the way to the southern part of the Choctaw Nation in 1832. One son, Fisher Durant, married to a full blood Choctaw , found a beautiful location for their home between Durant's present Eighth and Ninth Avenues. Fisher's son Dixon Durant is recognized as the founder of Durant and is honored as its namesake. As an early day minister, businessman and civic leader, Dixon Durant is credited with postorates in several churches and established the first store selling general merchandise in 1873. W. H. Hilton was elected as the first mayor of Durant, Oklahoma. A memorable event in Durant's rail history occured on April 5, 1905. A special southbound Katy train stopped in the city with none other than President Roosevelt aboard. Bryan County was created from Choctaw lands in 1907, the same time as Oklahoma statehood, and was named after William Jennings Bryan. He was nominated three times for President of the United States and at the age of 36 lost to William McKinley. He also lost to Woodrow Wilson, and William H. Taft. Woodrow Wilson appointed Bryan and Secretary of State. Bryan assisted in what is reffered to as the Scopes-Monkey Trial. Clarence Darrow defended Scopes, the teacher who taught evolution in school. Bryan won the case and dies just a few days after the trial in 1925. One of Durant's own was Robert L. Williams. He was the third governor of Oklahoma and was the first governor in the new Capital building. He was responsible for the Capital building being dome less because he was saving money, which was scarce because of the First World War. Durant's local airport is named after Ira Eaker. Ira Clarence Eaker was an aviation pioneer and a United States Air Force General. He was born in 1896 in Field Creek, Texas and moved to southeastern Oklahoma in 1912. He attended school in Kenefic, a community in Bryan County. He graduated from Southeastern State Teachers College (now Southeastern Oklahoma State University) in Durant. He entered the armed forces in 1917. Eaker was the first aviator to make a transcontinental flight that depended solely on aerial refueling. In 1943, General Eaker assumed overall command of both American air forces in the United Kingdom. He took over as commander of the joint Mediterranean Allied Air Forces on January 15, 1944. With 321,429 officers and men and 12,598 aircraft, MAAF was the world's largest air force. General Eaker was recognized on the cover of Life Magazine.